Our digital age is fueled by tweets, posts, and instant photo updates on our social networks, keeping us connected with friends and family. We are constantly updating and posting about our current events and what we are doing. While we are reading about them, we ourselves are posting pictures of our latest meal or a picture of our cat. Mainstream culture is driven by what is happening to the current second, turning the classic 15 minutes of fame to 15 seconds of fame. Using the fast as possible form of communication in social media and the real world is to use a QR code (Quick Response). This is a type of barcode that is scanned by a smartphone to link its user to a website or other online content. The punk arose out of a desire to go against the grain of what was becoming mainstream rock and roll of the late 70s. Wearing ripped jeans and leather jackets that were altered by hand was standard. By creating outfits that set them apart, punks generated a new raw form of craft or DIY culture. Punk patches were worn to represented the bands they enjoyed or the groups they were a part of. This helped create camaraderie between fellow punks who would befriend each other by what they wore on their shoulders. Punk reshapes itself in the digital age, forming its new identity, from a hybrid of computerized symbols and raw grunge esthetic. The concept of “cyberpunk” stems from how a computer-nerd turned-hacker would want to represent themselves in a dystopian future – as depicted in films such as “Blade Runner” or “Hackers.” Our current future is a digital age which is covered in tags and self promotion. 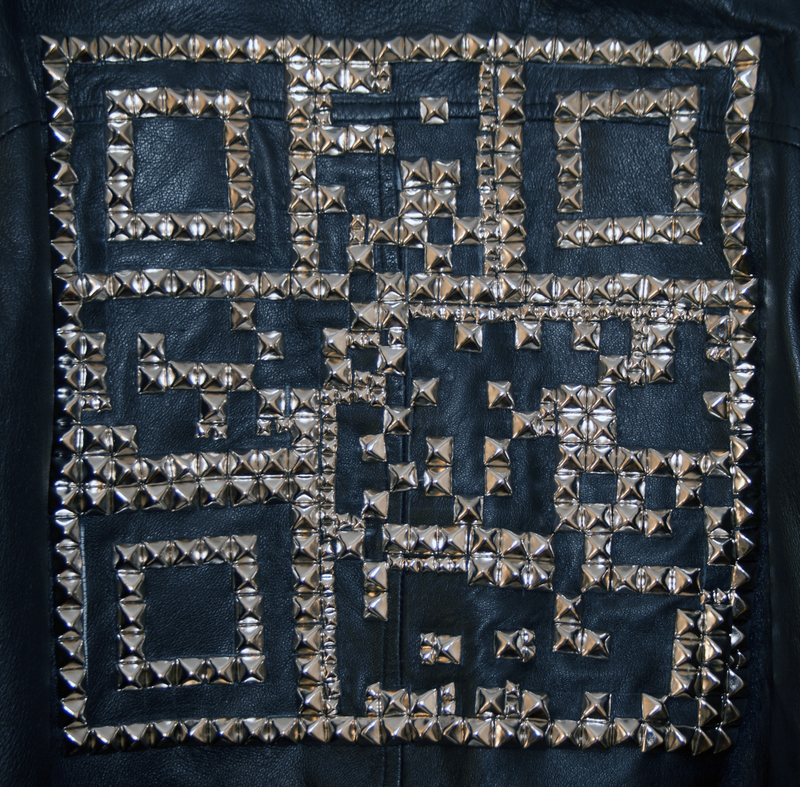 The jacket is decorated with metal studs equivalent to the punk craft and DIY style. 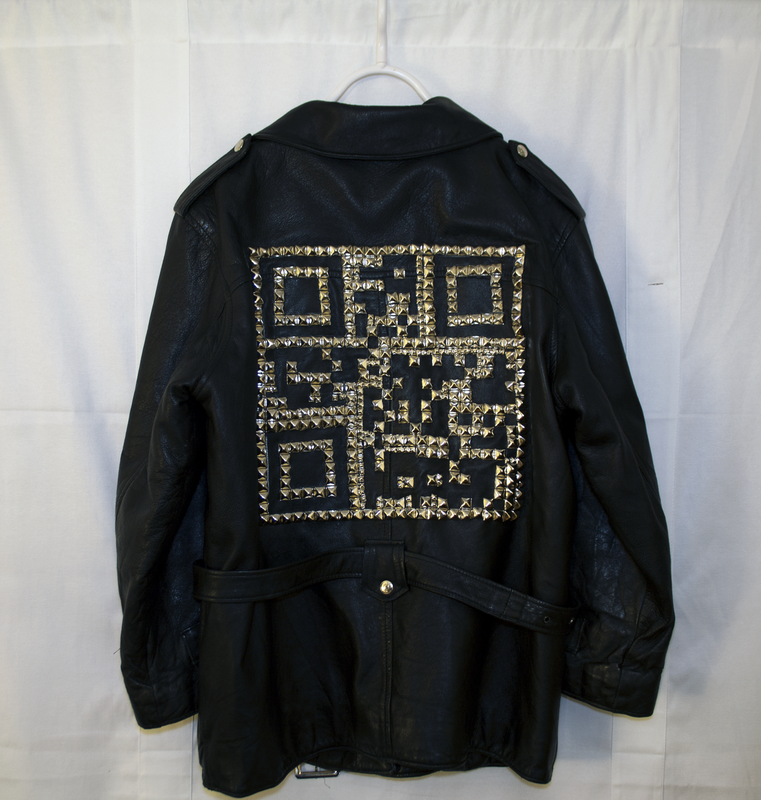 The pattern created from the studs resembles a QR code - a barcode that is scanned with a person’s smartphone, which in turn sends them to a website or connects them with social media.